The problem of broken down or missing teeth can be easily remedied in most cases. However, ignoring these dental problems may cause additional tooth and bone loss which can lead to more expensive treatments. That is why it is better to take care of minor problems right away, before they get bigger and more expensive to repair. Gaps between teeth can occur naturally or when teeth have been lost. A gap between the front two teeth is natural for some; many choose to have it closed for cosmetic reasons although it poses no harm to oral health. People often live with spaces between their back teeth for years because they do not cause a cosmetic problem. However, these spaces can lead to dental problems. Dental implants are a valuable and exciting treatment option for today’s dental patients. They offer a real advantage – a replacement for a missing tooth that looks and feels natural. It becomes incorporated in your jaw tissue and results in a stronger restoration than other tooth replacement options. Implants can be used to replace a single missing tooth, multiple missing teeth, or can be used in conjunction with partial dentures or full dentures to increase retention. 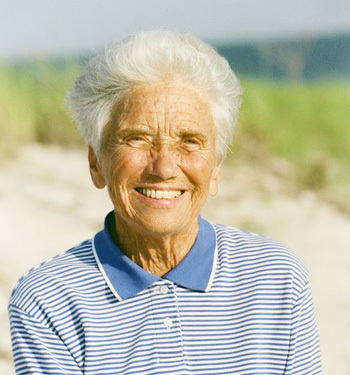 If you are averse to wearing removable dentures, implants may be the right choice for you. Unlike a bridge, an implant does not require compromising the adjacent healthy teeth. If you have not been to the dentist in a while, you will be amazed at what can be done to improve your dental health and your smile! Read this New York Times article on Dental Implants. 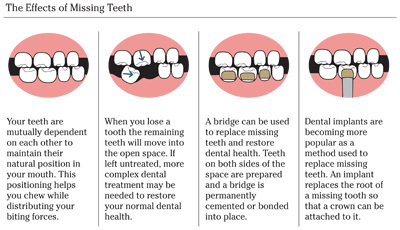 Bridges are a natural-looking replacement option for missing teeth. Bridges can be supported by adjacent teeth, by implants, or by a combination of both. The benefits of bridges are that they can fill most gaps, they last a long time with proper care, and they look natural. Generally bridges can be fabricated in two visits to Dr. Paris. Removable partial dentures provide a prosthetic replacement of one or more missing teeth. It is an option for patients who want to replace teeth for functional or aesthetic reasons, and who cannot have a bridge for any number of reasons (such as a lack of teeth to support bridge). Removable partial dentures have metal or plastic clasps that clip onto supportive teeth, making it more stable. In order to maintain your healthy gum tissue, partials need to be removed at night. A full denture provides a prosthetic replacement for all of the missing teeth on either the upper or lower jaw. Conventional dentures are removable but there are also options for dentures that clasp onto dental implants, allowing for tremendously increased retention. Like partial dentures, a full denture will need to be removed at night to maintain tissue health.